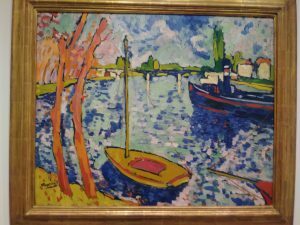 Maurice de Vlaminck painted “The Siene at Chatou” in 1906. The piece, at first glance, is a river scene stylistically similar to that of the other Paris Impressionists of the early 1900’s. Chatou is made up of a plethora of color and texture. Vlaminck uses dynamic brushstrokes to build the scene. He also pays special attention to light and shadow, and how they play in the reflections on the water. Unlike other Impressionists however, Vlaminck uses more bold and unnatural primary colors, similar to that of the artists belonging to the Expressionists movement. 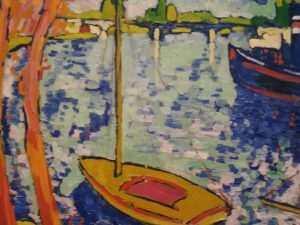 By combining the elements of color and texture from each art movement, Vlaminck is able to blur the boundaries between two art movements in Paris near the beginning of the 20th century: Impressionism and Expressionism, and incorporates aspects of both movements into his work. Chatou is approximately 32×39 inches in size. It is a scale model of a real life scene, likely painted on site. There is a peaceful mood to this painting. Vlaminck rejects the portrayal of a populous Parisian city, beautiful women, or bourgeoisie elites, whose presence dominated much of the art of turn of the 20th century Impressionist and Expressionist movements. Instead, nature is his subject. He hints at humans in their manmade structures: the boat and the distant village. Vlaminck represents the scene in a sort of subjective truthfulness. His choice of color, line, texture, and subject matter, all contribute to an overall mood. IN channeling inspiration from the art movements happening around him, Vlaminck was able to create a new sort of impressionistic landscape that adds the expressionistic quality of color and line. The composition of Chatou creates a clear eye path that guides the viewer around the painting. Starting from the striking red trees on the left side of the painting, the vertical lines of the trunk curve slightly inward to the the center right. From there, the viewer can become immersed in the amorphous clouds that are painted with blues, aquas, whites, and pastels, that give an atmospheric appearance.. A stack of green trees on the right side of the painting guide the viewer back down to a distant shoreline with one small yellow road and a few pale, red roofed houses. The boat in the distance is a dark blue that dissolves into it’s reflection, that then dissipates into the ripples of the water. A red boat in the bottom right corner peeks through the composition, pointing at the small boat that is off-centered near the shoreline where the viewer can then follow the trunk of the red trees back up to the sky again. In creating this circular eye path, the viewer is able to take in every detail. Vlaminck guides the viewer along slowly, allowing them to become immersed in the scene without getting lost. The colors used in Chatou are a mix of pastels and primary colors. Manmade objects are a predominantly primary colors, while nature is given a softer pastel treatment. Trees are in shades of red and orange, which creates an unnatural quality. Distant trees are orange and pink, and have a softer edge. At the horizon line of the painting, there are green and chartreuse blocks that hint at the presence of other trees. The sky and water have a similar color palette: various shades of blue, aqua, white, and pink. The boats in the river are red, dark blue, and ochre. There’s little or no black used in the painting. Instead, shades are created by mixing colors. The shadows and outlines are created with dark hues. Because of this use of color, from a distance there is a softness to the overall appearance of the painting. The quality of the line is gestural as if the artist were trying to capture a moment as quickly as possible. Close up to the painting, one can see the jaggedness and sheen of the oil paint. It appears daubed on with an oversaturated paintbrush, or squeezed straight from the tube onto the canvas, which then became a mixing palette. The lines in Chatou are build up with textures brush strokes. The boats and tree trunks are outlined with a thin blue line that suggest a hard edge, while natural elements have a softer liner. The clouds have a fish scale-like pattern of overlapping color. The clouds reflection in the water is a soft radial ripple made up of more broken brush strokes. The variation in line throughout the painting adds to the interest of the piece. Vlaminck tries to capture that organic quality of nature by differentiating texture. By incorporating stylistic elements of color, texture, and line from the Impressionist and Expressionist movement, Vlaminck was able to create a believable, fantastical scene. Likely, his presence in France during multiple art movements near the turn of the century, and his proximity to other prominent artists at the time helped to influence his style. Much of this influence can be seen in the overall dreamy quality of the work. Chatou it is not life-sized, but it gives the viewer the impression of a faraway place. This is the illusion though: The closer a viewer gets to Chatou, the less focused it becomes, perhaps serving as a reminder that this idealized version of reality is an illusion in and of itself.